Here's an opportunity to shop for a great cause: the BeautyBloggers.org annual charity auction. For the second year in a row, beauty bloggers and brands have joined forces for an online auction benefiting Doctors Without Borders. Doctors Without Borders is an international medical humanitarian organization providing independent, impartial assistance in nearly 70 countries to people suffering the consequences of violence, neglect or catastrophe. Participants have donated a eye-popping cornucopia of the best perfumes, potions and products. Donated goodies range from the hottest items from this year’s holiday collections to hard-to-find exclusives and limited edition cult favorites. As a foolishly hopeless makeup junkie, my addled brain is going “Ka-HOO-gah!” at the sight of all Le Métier de Beauté maquillage and panted-over but out-of-circulation MAC shizz. So what is Katie Puckrik Smells donating to the cause? 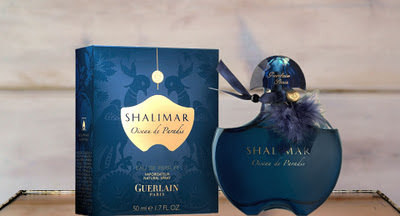 A brand-new bottle of Guerlain Shalimar, natch -- the Oiseau de Paradis limited edition eau de parfum, to be exact. Shalimar is the original “bad girl” perfume: a sensual crème brûlée and smoky leather blend with a citrus twist. Back in the 1920’s, Shalimar was the flapper’s badge of dishonor -- small wonder for such a grown-up vanilla that flicks its own whip. This extremely rare limited edition bottle is decorated with feathers that represent the birds of paradise that guard this elixir in the gardens of Shalimar -- or in your boudoir of passion, as the case may be. The fragrance is still classic Shalimar, but the bottle is what makes it even special-er. Go to BeautyBloggers.org to view all of the fragrances, make-up, skincare gadgets and retail experiences on offer. The auction will be live Monday, November 28th through Monday, December 12th. When the auction ends, winning bidders make their donations directly to Doctors Without Borders, through the site’s secure giving page. Please note: When registering for the auction, your name and email address are private. Use an email address you check regularly, because that's how we'll get in touch with the winning bidders. Email addresses will not be used for any other purpose. More about the Beauty Blogger event here. This is beautiful. God bless your kind heart, and those of other people involved.